There’s been a lot of nonsense in the news over the past week about Birmingham. 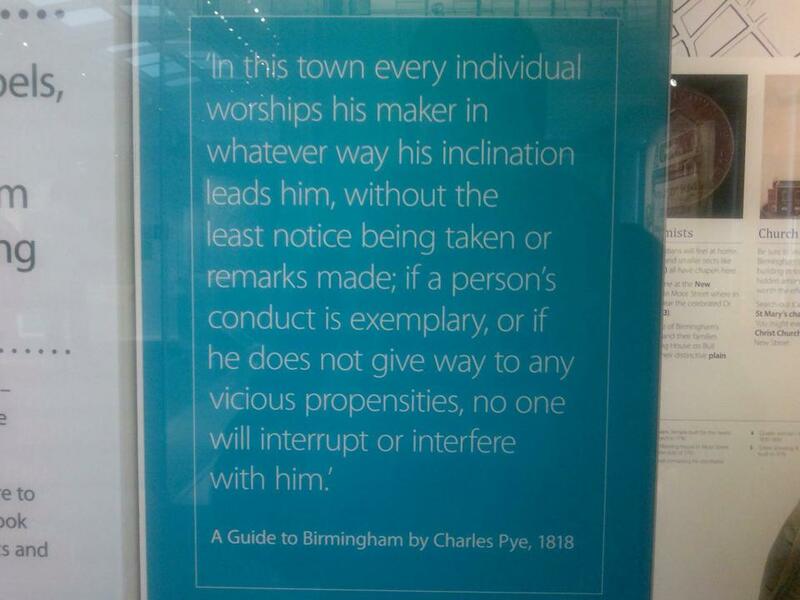 What am I saying – there’s ALWAYS quite a lot of nonsense about Birmingham. And whilst it’s fair enough to mock the city for its concrete fly-overs and funny accent, it’s definitely incorrect to that it’s a no-go zone for people who happen to not be Muslim. Why do we even say Muslim? It’s more accurate to say Pakistani, Somali, Syrian, Iraqi… this is a city full of different people from different countries, with different faiths and different cultures. In one single day here I might meet the girl in a hijab who works in my local supermarket, drive past a nun by the Catholic Oratory on the Hagley Road, see the friend who happens to be Sikh (whose sister is married to a Buddhist), email my Hindu colleague who is now studying Christianity, chat with my Yogi friends and have a cup of tea with those who choose to be atheist. The contrasts in this city are enriching and endlessly interesting. Everyone just rubs along together. The e-magazine I Choose Birmingham posted this on Facebook a few days ago, which sums it up pretty well. Coming from rural Worcestershire, where everyone is pretty much the same (i.e. white), the thing I really appreciate about Birmingham is abundance of food from different cultures. Within a 1 mile radius of our flat I can find Turkish, Chinese and Thai supermarkets. But Indian food is where it’s at: Morrisons sells lime chutney by the gallon and even Waitrose has a shelf dedicated to properly-large packets of ghee and dhaal. 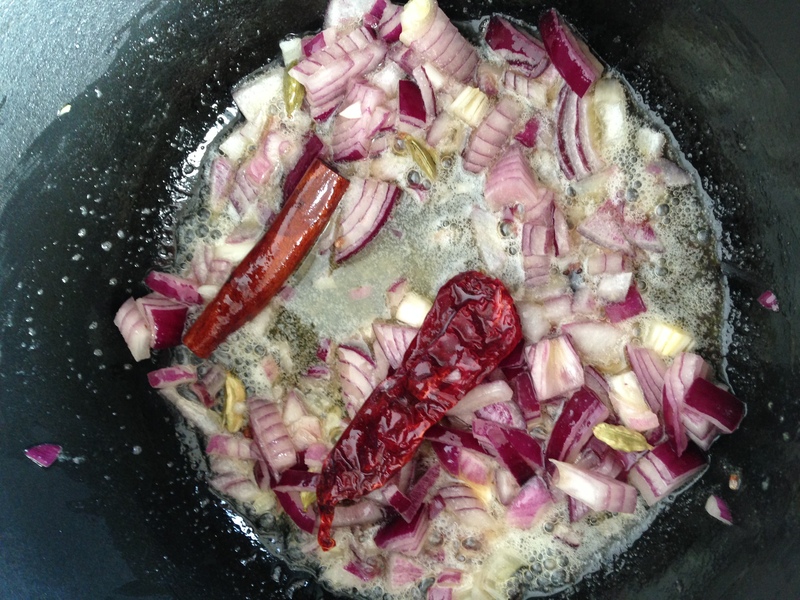 There are tricks to making a good curry and although I am still in the amateur stakes, my good friend Tune, who hails from Calcutta, has taught me a few of them. 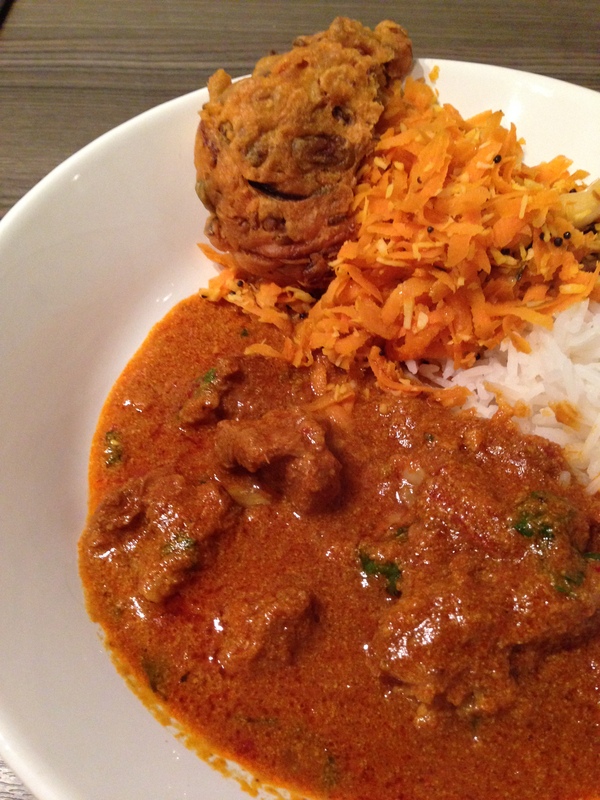 I’ll share them here with this lamb rogan josh, which I’ve adapted from Rick Stein’s India book. This is another one of those long-cooked dishes which gives great value for money – I used a half-shoulder of lamb, £6, which I boned and diced at home. There’s enough here to feed at least 6 I think. 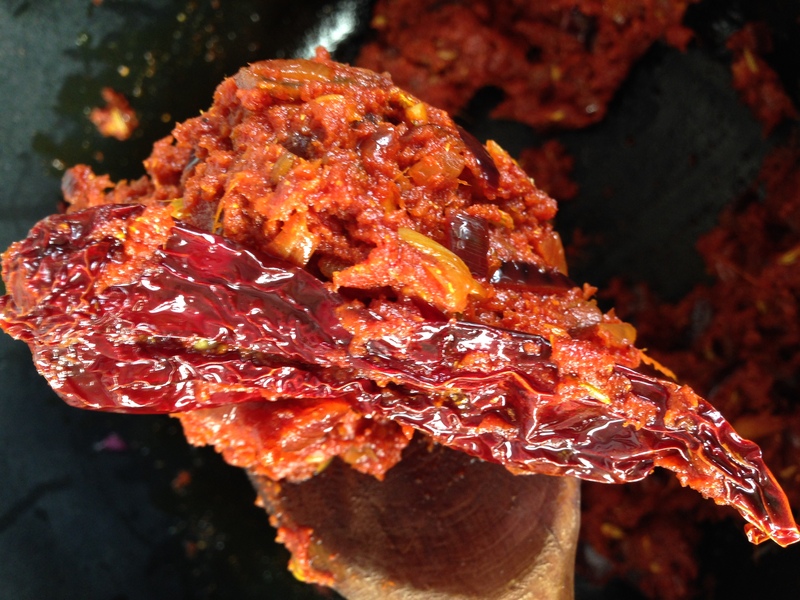 The amazing red colour comes from Kashmiri chillies and also tomato puree, which is used in abundance. So first up, temper the whole spices in ghee or oil – warm the oil and fry the spices for a minute or so until they become aromatic. I’m using a whole dried chilli, cinnamon stick, cloves and cardamom. Then in goes the onion, which is cooked down for a good ten minutes with a pinch of salt, until soft. When the onion is done add ginger and garlic, and cook for another minute. Now, on a very gentle heat, add all the dried spices. They should be prepped and ready-to-go: any faffing at this stage risks an unattended pan, which means burnt spice. Keep them moving in the oil and if there’s any chance of burning, immediately pour in some cold water. 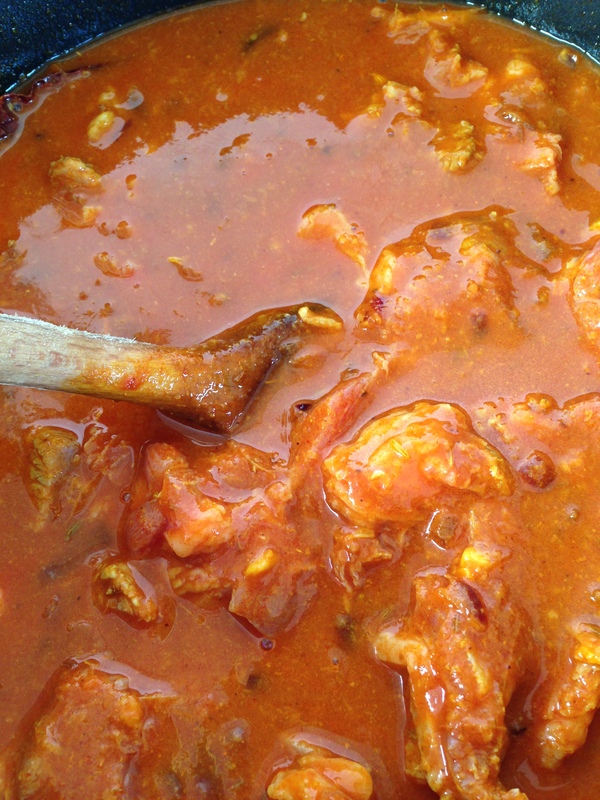 The best thing about these kind of curries is the ease of it all: you make a strongly-flavoured base, chuck in some meat, top it up with liquid and leave it for an hour or two. So add the lamb to the pot then top up with cold water. Pop the lid on and simmer on a gentle heat for an hour or so, until the meat is tender. No need to brown the meat. Top up with water then leave to simmer. When the meat is done, check the seasoning and add salt if needed. It may need reducing so just leave the lid off whilst it putters away on a slow simmer. To serve, season with extra garam masala and ground fennel, stir in a large dollop of natural yoghurt and the coriander leaves, then you’re good to go. Although actually it’s better the next day. Your call. In a large casserole, heat the ghee or oil/butter. 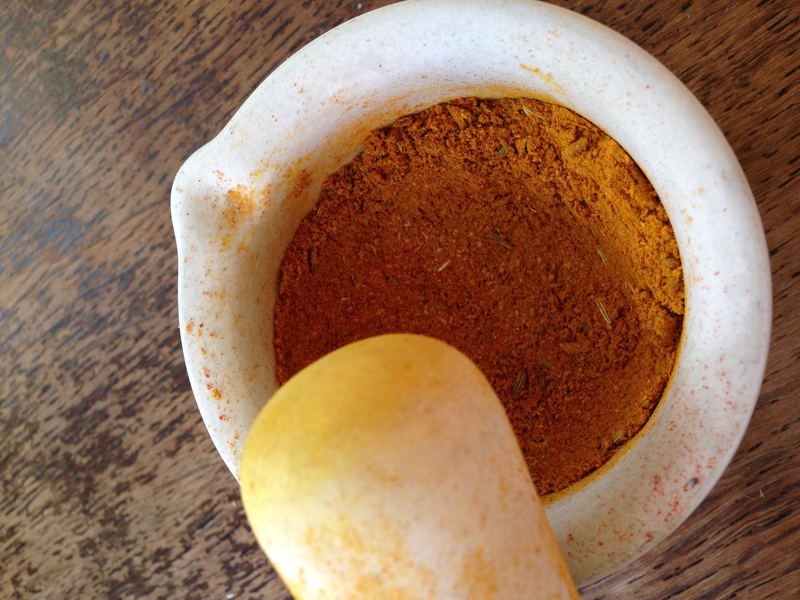 Fry whole spices until aromatic. Add onion and salt, soften for 10 minutes. Add ginger and garlic. Meanwhile prep your dry spices. Turn the heat down and add spices, cook for a minute (have water nearby in case of burning), then add the tomato puree and cook for a minute or two. Add the lamb and water to cover, pop the lid on, simmer for an hour or so. Check seasoning, reduce if necessary. Add yoghurt and coriander leaves, and season with extra garam masala and ground fennel. Serve.